Example: We have 1 liter fuel contain 12% oil. We want to increase it's percent to 20%, so how much castor oil we need to add? 96 cc (ml) castor oil need to be added to 1 liter 12% oil fuel to bring the oil percentage to 20%. If you want to get result in cc (ml) for 1 quart fuel, then multiply the result by .946 . For example multiply the result at above: 96 x .946 = 90.8 cc (ml) castor oil need to be added to 1 quart fuel contain 12% oil to get 20% oil content. If you want to get result in fl. oz for 1 quart fuel, then multiply the result by .032 . For example multiply the result at above: 96 x .032 = 3.07 fl. oz castor oil need to be added to 1 quart fuel contain 12% oil to get 20% oil content. Of course nitro percentage will be a little lowered. I have always struggled with algebra except for some very basic formulas. I got similar results using basic arithmetic. I know I posted the fuel calculator some place. Either here, RCG, or SH. 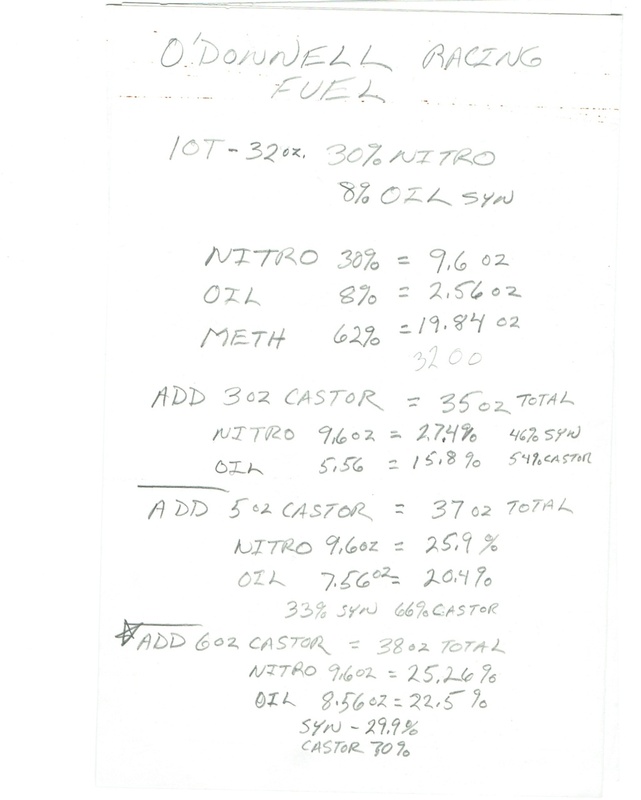 It does quarts based on two known fuels' content of nitro, methanol, oil...with oil as a percentage of synth/castor. In go all of the knowns, and out pops the required castor to make 32 oz. For a single fuel, you out it in both fuel sections. ISTR it is in RCG's 1/2A section. I also redid the numbers for 8 oz. PM your email address so I can send the 8 oz spreadsheet. Yep, I vote for this one as well.. Works a treat. Fred, I did not understand that you meant oz or fl oz? I need to calculate the ingredients by weight or by volume? According to the figures you just gave us, your current fuel has, 20% nitro content and 10% oil content, leaving 70% methanol. In order to accomplish this you will simply need to add 4.1 ounces of castor/synthetic oil to your 33.814 ounces of fuel. When you're done, you should end up with 37.9 ounces (0.3 gallons) of newly blended, custom fuel. Thanks. In example it is 12% to 20%, not 10% to 20%. Calculator give 3.1 oz result for 12% to 20%, and my calculating result is 3.07 fl. oz, so nothing is wrong I think. In you example the bottle claims 10% oil.... BUT is it? I don't know, but I think that volume must be used in commercial fuels, because fuel is liquid, not solid. They use quart wording for fuel bottles, but not libres or pounds. Levent Suberk wrote: I don't know, but I think that volume must be used in commercial fuels, because fuel is liquid, not solid. Air-fuel ratio is measured in pounds of air vs pounds of fuel. Nitro % also changes with temperature. consider it close enough to measuring by weight. Here's an interesting article by Duke Fox, maker of the Fox engines and fuel, copied from Model Engine News. It has various typos due to I believe scanning errors with very little proof reading. I've made the corrections, although I may have missed a few. Duke's Mixture wrote: You can drive your car anywhere in our country and fill up your gas tank with any brand fuel, and reasonably expect it to perform about the same as any other brand. This is because gasoline refining companies have voluntarily established standards on viscosity, flash point, octane, etc., so that just about any automobile produced will run okay on various manufacturers' fuel. Unfortunately. this is not true in the model airplane business. Commercial model fuels are sold with a variety of types and quantities if of oils, and some measure nitro by weight, some by volume, and some don't seem to measure it at all. The reluctance if of a fuel blender to put his ingredients on the can makes me a bit suspicious that he is trying to hide something - or, perhaps, the absence if of something. I would like to see each blender fuel to voluntarily print on his container just what the ingredients are in his fuel so the modeler know[s] what he is getting. Also, I would like to see the quantities if of each ingredient listed by volume. All model plane fuel uses commercial methanol as its base. It is commonly known as wood alcohol because it was first produced from wood chips. Now, most if of it is produced from natural gas, I am told. In any event, methanol, when bought in tank car quantities, is quite reasonable in cost. It is not the alcohol that runs up the cost if of model airplane Fuel, it is what you put in it and put it in. While alcohol costs less than $1.00 a gallon, a good oil costs $6.00 to $8.00 a gallon, and nitromethane costs $30.00 to $35.00 a gallon when purchased in quantities. Under the pressure if of competitive pricing, any Fuel blender is constantly tempted to use less and less if of the high priced ingredients and more and more if of the low priced ingredients. Now, about the ingredients themselves. Methanol is a single chemical, and not a mixture, as gasoline is. The manufacturing plants deliver it 99.9% pure, or better. About the only thing that can happen to the methanol is if it is sloppily handled, it can be contaminated with water. It only takes a Jew few drops if of water in a gallon if of fuel to produce noticeable flameout tendencies. Likewise, nitromethane is a nearly pure product, and is sold in one grade only. You should note that nitro content by weight will be in the order if 2/3 the quantity as when nitro content is measured by volume. A modern R.C. motor if of a 40 size class requires about 22% oil to be well lubricated and to have a good, long life. Larger motors need less oil, percentage wise, than small ones. The reason being that as the size if of the motor increases, the displacement goes up as the cube, while the area to be lubricated goes up as the square. Thus, a motor with a 1 1/2" bore would be as well lubricated on a 10% oil mix as one with a 3/4" bore would be with a 20% oil mix. Unfortunately, some manufacturers have been delivering fuel with as little as 12% and 13% oil, and recommending it for 40 size motors. The result if of extended use if of such a Fuel is as you would expect, an abnormal rate if of wear in the motor, and on rare occasions, a catastrophic failure. Over the years a great many different oils have been used in the search for something that works better and costs less than castor oil. The most usual if these are the glycol r\type synthetic lubricants. The glycols have good lubrication qualities, but they have one major shortcoming, and that is that they vaporize at somewhere around 500° F to 550° F. Lawn mowers, outboard motors, and the like are never run hard enough so that this is if any significance. But a model airplane motor that is run hard could have a piston and wrist pin temperature in a 700° F range, and because if of this, the motor using pure poly-alcaglycol lubricant is almost certain to have catastrophic ring, wrist pin, and upper rod failure. Castor oil is the only oil I know if that will continue to Junction at 800° E F. Synthetic oils if of the phosphate ester type also have this shortcoming. Other oils that have been used are soybean oil, fish oil, and modified mineral oils, such as turbine oil. I am sure that there are dozens if other oils that different Fuel blenders have tried, and some are using. I would like to point out that lubrication is not the only requirement if of the oil. The rusting if of the steel parts, such as crankshafts and bearings, is also a consideration. Motors that were run 30 and 40 years ago on a straight castor oil, alcohol, nitromethane mix show little rust. Some motors that have come back for repair have the bearings rusted until they are ruined. I have to believe that this was caused by some sort if of a breakdown in some if of the synthetic oils or additives used. Over the years there have been a lot if of different additives used in model airplane Fuels. Propylene oxide mixes well in Fuel, and it only takes 2% or 3% propylene oxide to very materially improve the idling characteristics if of a motor. However, the government has determined that propylene oxide is a carcinogen (cancer causing agent). Any blender who now uses propylene oxide is laying himself open to all sorts if lawsuits. Nitroethane is a sister chemical to nitromethane, and while it is not as effective a power additive as nitromethane is, it is very oily, and a very excellent solvent. Nitroethane is a very useful fuel ingredient for motors with an aluminum piston, because it keeps the inside if the motor nice and clean, as well as providing additional lubrication. A motor with an iron piston should not use a Fuel containing nitroethane or synthetic oils because they tend to wash away the glaze castor oil puts on these surfaces, giving their long wearing characteristics. In summary, what I am saying is that I would like to see all the Fuel manufacturers list the nitro content by volume, give the oil amount and type in percentages by volume, and identify any other additives used. Smaller motors need larger percentages if of oil than large ones. Good, middle if of the road figures would be 22% for 40 size and under, 18% for 60 size, and less for larger motors. In order to understand the importance of a good oil in model airplane Fuel, I would like to report a conversation I had with a research engineer with one if of the large oil companies. He said that an automobile engine that would normally run 100,000 miles on conventional gasoline would do well to run 2,000 or 3,000 miles on pure methanol because methanol had no lubrication value whatever. The challenge in exploring alcohol based Fuels for automobiles was to bring up the lubrication value if of the alcohol to match gasoline, and it appeared that this could not be done economically. The oil in your Fuel is probably the most important factor in how long your model motor serves you. Extracted from a Fox Manufacturing infomercial, Model Airplane News, August 1989, p49. Also, I have highlighted in red Duke's comments related to why fuel should contain a significant component of Castor oil in it for engine longevity. I have highlighted in orange his comment about not using synthetic oil in iron piston engines because the consensus now is some synthetic content keeps excess Castor varnish down. (I used to regularly disassemble my Cox engines and scrub away this varnish build up that reduced RPMs with steel wool to restore power.) Of course a well worn engine like an old Fox or McCoy may need that varnish to retain compression. » Tamiya 1967 Lotus 49 ... 1/12 scale.